SAN SALVADOR/ARCATAO, Nov 9 2017 (IPS) - Among the sea of names of victims of the Salvadoran civil war, engraved on a long black granite wall, Matilde Asencio managed to find the name of her son, Salvador. She then placed a flower and a lit candle at the foot of the segment of the wall where it read: “‘disappeared’ persons 1988”. Asencio, 78, arrived with her husband, Macario Miranda, 87, to the Monument to Memory and Truth in San Salvador, on Nov. 1, the eve of the Day of the Dead, to pay tribute to their son Salvador Arévalo Miranda, who was captured and “disappeared” by the Salvadoran army in August 1988. “We have been in this struggle for almost 30 years, we are old and sick, but we will not tire, we will not stop until they tell us what they did with him,” Asencio told IPS, holding a portrait of her son. The 1980-1992 civil war in this Central American country of 6.8 million people left some 75,000 people dead and 8,000 missing. Like Asencio and Miranda, dozens of relatives visited the monument in downtown San Salvador to at least be able to place a flower in memory of their deceased and “disappeared” loved ones. But they also went to demand justice and truth as part of a process of reparation, 25 years after the peace deal was signed. Groups of victims, supported by human rights organisations, are promoting the creation of a Law for Comprehensive Reparations for Victims of the Armed Conflict, because the State has failed to remedy the wrongs caused, both material and emotional. “The idea is that the civilians who suffered the war, no matter from which side, can receive reparations,” activist Sofía Hernández from the “Marianela García Villas” Committee of Relatives of Victims of Human Rights Violations told IPS. The project proposes the creation of a Reparations Fund, a registry of victims and various measures for symbolic and material reparations. Among these are that the beneficiaries and their descendants have preferential access to the public education system, at every level up to tertiary education, access to the social security healthcare system, and access to a free psychosocial care programme. Also, if approved, it would grant benefits for obtaining land, housing and preferential credits, and it proposes the creation of a Bank of Genetic Profiles, in order to identify the deceased, and with that information, to be able to initiate exhumation processes. It also proposes the creation of an initial fund from the General Budget of the Nation, of up to one million dollars, to meet the financial implications of the law. “These people had their houses burnt down, their children were ‘disappeared’, and there have been no reparations,” said Hernández, who has suffered first-hand the ravages of war. In March 1980, a contingent of the National Guard entered the village of San Pedro Aguascalientes, in the municipality of Verapaz in the central department of San Vicente, where she lived with her family. “My brother-in-law was yoking oxen to go to fetch water in the cart and he was shot, along with two of my nephews, they were killed in the yard of their house,” said Hernández, also a member of the project management group. The house of her brother Juan Francisco Hernández was set on fire, but neither he nor his family were there. But then, on May 2, he was captured and has been missing since, along with two of her nephews. The bill has not yet been debated in the single-chamber Legislative Assembly, and right-wing parties are not likely to vote for it as they consider the initiative part of a leftist agenda. The search for truth and justice in cases of enforced disappearances and extrajudicial executions is another important component of the reparations process, said the victims who spoke to IPS. 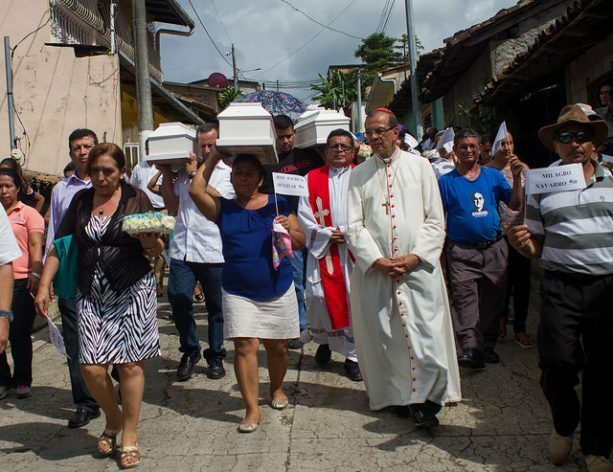 After more than three decades of not knowing the whereabouts of her son, José Mauricio Menjívar, or whether he was dead or alive, Calixta Melgar was finally able to give him a Christian burial on Sept. 22, in the municipality of Arcatao in the northern department of Chalatenango. “Now I know where he is buried, where to go to put a flower, I feel that my grief has been relieved a bit,” Melgar told IPS, through tears. José Mauricio, who was five years old in May 1982, was killed by soldiers in the village of El Sitio, and his body was left abandoned, along with those of five other children who suffered the same fate. In the confusion and chaos that followed a military incursion into the area on that date, the children, three boys and three girls, were held by the military and executed in cold blood. The remains remained buried there until January 2017, when the National Search Commission for Missing Children during the Internal Armed Conflict and the non-governmental Pro-Búsqueda Association for the Search of Disappeared Children found them and identified the victims using DNA. For the latter, they had the support of the Argentine Forensic Anthropology Team and the state Salvadoran Forensic Medicine Institute. “Apart from the sorrow, I also feel happy that my little boy is no longer abandoned where he had been left, and that has helped me to heal wounds that were very much open,” said the 57-year-old Melgar, before the funeral service in the village church. During the Catholic religious ceremony, the six small white coffins holding the remains of the children were placed in front of the main altar. Pro-Búsqueda has managed to solve 437 cases of missing children, 83 percent of whom have been found alive, the institution’s executive director Eduardo García told IPS. This joint and coordinated work between Pro-Búsqueda and a government agency to solve cases of children who went missing in the war was unthinkable not too many years ago. In this regard, García said that there has been a slight change in addressing the issue of truth, justice and reparation under the two successive governments of the leftist Farabundo Martí National Liberation Front (FMLN), which became a political party after the peace agreement and has been in power since 2009. “It is evident that the government is showing greater sensitivity; it has initiated processes of forgiveness and continues to maintain a National Search Commission by executive decree,” he said. But he said more could have been done, for example, allowing access to military archives to help clarify serious human rights abuses committed during the war. “The Armed Forces has systematically denied information that could clarify these facts, although the Commander in Chief (President Salvador Sánchez Cerén) is leftist,” he said. Until now, only the Office of the Attorney General of the Republic has begun to timidly investigate some of the cases, arguing that it has neither the capacity nor the budget, while the Legislative Assembly does not even want to recognise Aug. 30 as the National Day of Disappeared Persons. Reparations from whom? The US trained death squads who murdered? The American trainers at School of the Americas? The American corporations that paid the American politicians to support genocide in El Salvador? The Salvadoran politicians and land owners who helped? Destruction of the predatory capitalist system that has caused such horror is the answer. Nothing else is worth the energy.